With today being Thursday, which sort of rhymes with thrifting, I thought I’d finally share with you, my vintage loving trash to treasure making friends, my thrifting bounty. 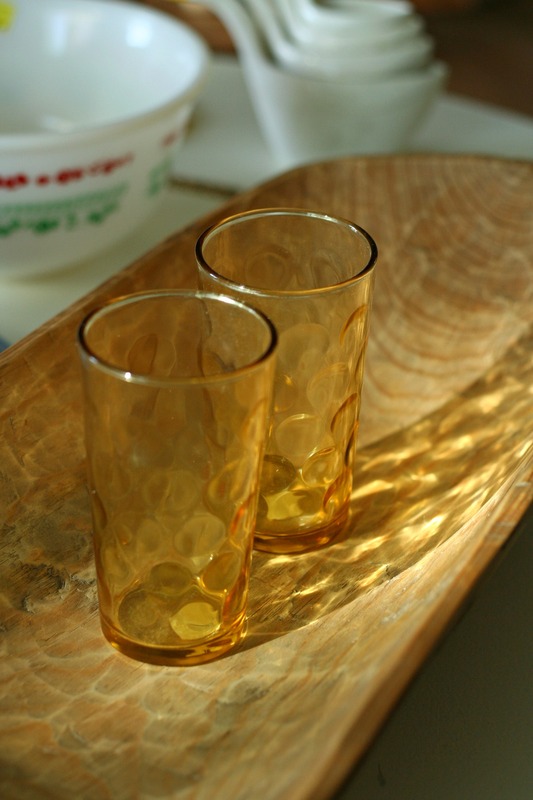 I have toyed with the idea of making this a weekly series, in which I’d share all the great treasures I’ve found and added to my hoard or have simply found blog worthy. This series will be titled Thrifting Thursdays, original right? I’m sure there aren’t a zillion blogs out there with that exact blog series. Now that we have established that I enjoy buying items at a cheap price, let’s move on to the eye candy shall we? First off, I’ll talk about the newest additions to my owl hoard. These little owls were a bit of splurge. The matching set was sold as separate pieces, at $3 each that brings the total investment to $9. But I just couldn’t leave them, that coffee owl makes me very happy, his wing holds a spoon. I think I will let him hold my peppermint tea bags, and just add a cute little spoon for fun. The salt and pepper shakers will probably be just for looks. Alongwith all the other S/P shakers I bought and have no idea what to do with. And those three owl trivets, they were .69 each. And I’ll actually use them! Nothing makes me happier than buying something cute and useful!! 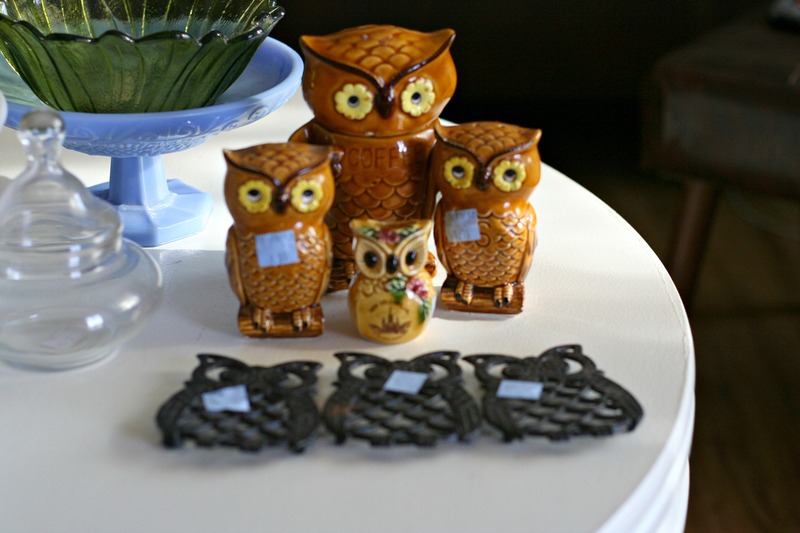 And that little owl there in front of the big guys, he’s a momento from someone’s vacation to New Orleans. I have no connection to New Orleans, nor have I ever visited, but he was just so darn cute, and only .99. It may be time to seek help for this owl addiction. 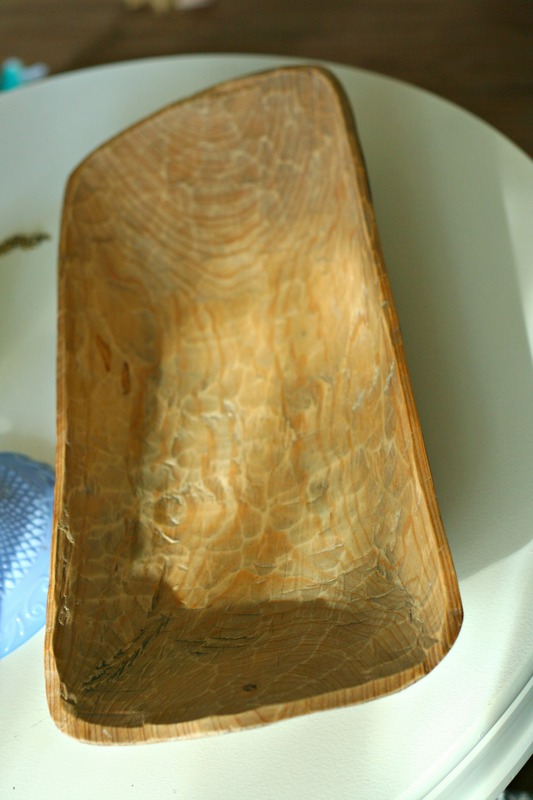 A rustic dough bowl, I know it sort of looks odd, but they can be dressed up to be totally awesome. Stay tuned on a post dedicated to making dough bowls pretty, aren’t you excited? 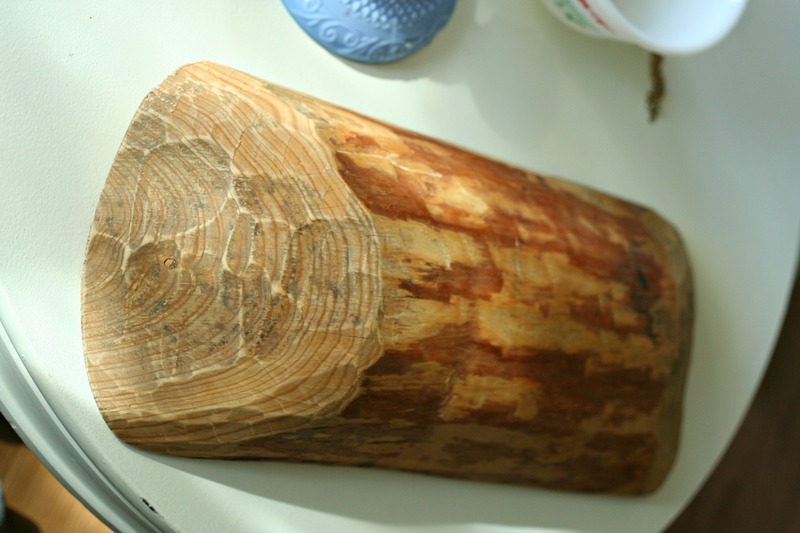 This particular dough bowl is basically a hallowed out log, unless I’m completely wrong in calling this item a dough bowl and it’s actually meant to be used as a latrine, in which case I may need to remove it from my dining table. Either way, I love it, especially for 3.99! 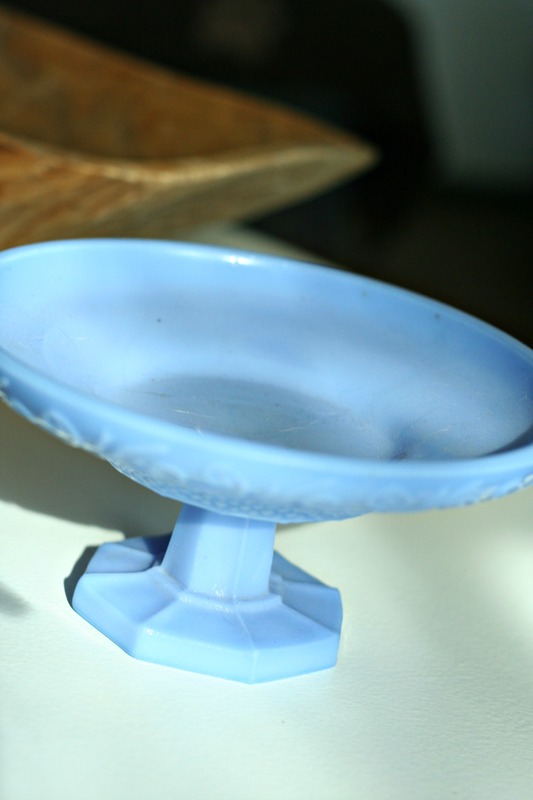 This pretty little blue cake plate is also part of my hoard now, I thought it would be nice the next time I bring brownies to the office. 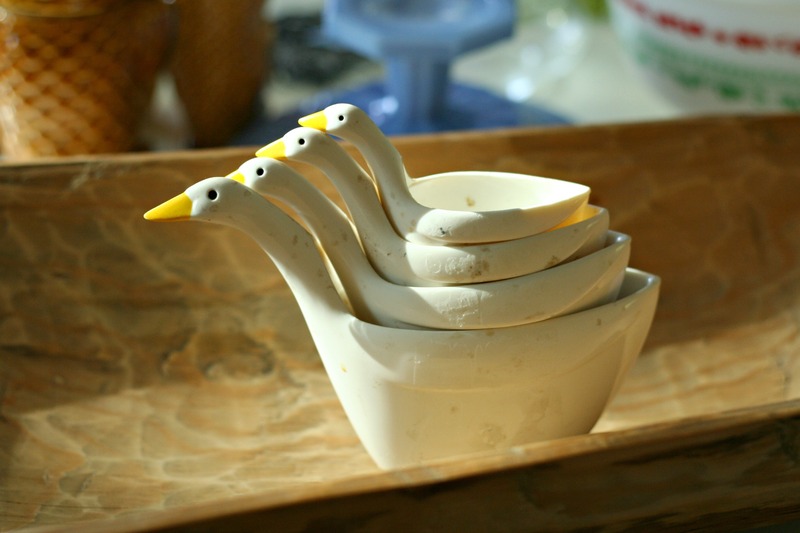 And I can use these cute nesting goose measuring cups when I do make those brownies. After they’ve been cleaned up of course. 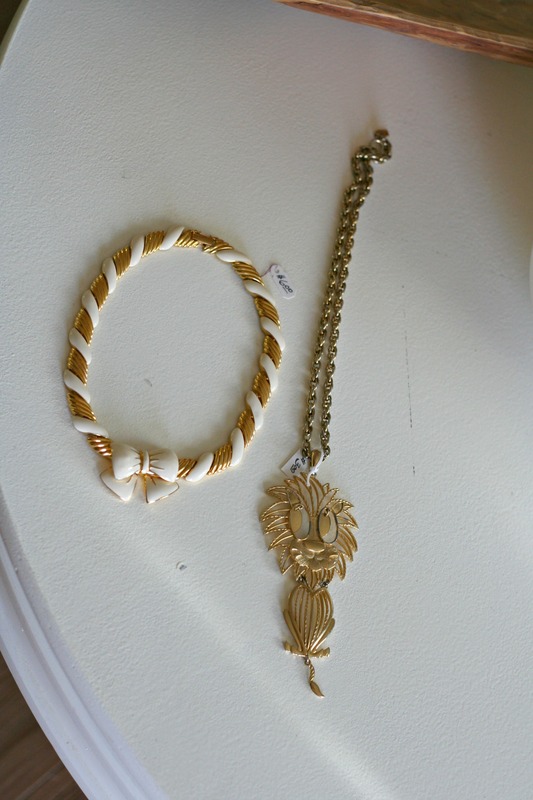 My most favorite items found this weekend are these quirky necklaces. 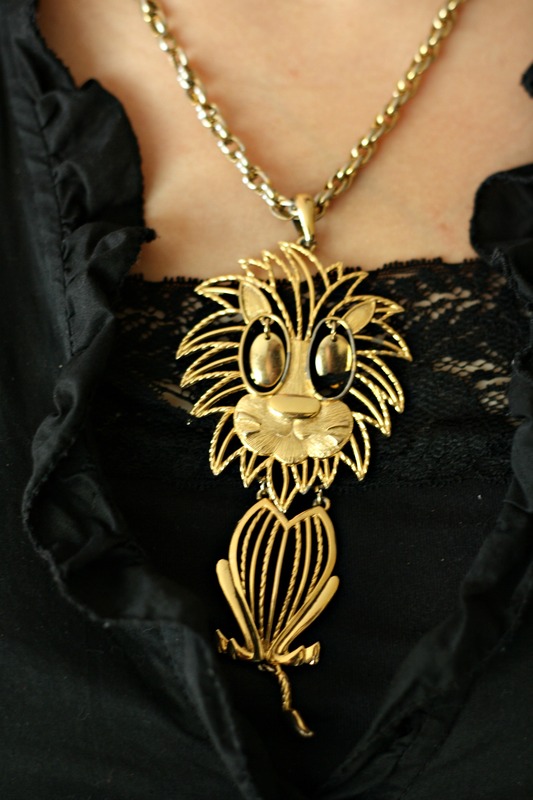 I wore the lion the other day. He’s huge at 3 inches long and nearly that wide, definitely a statement piece. People either hated it or loved it, I love it. 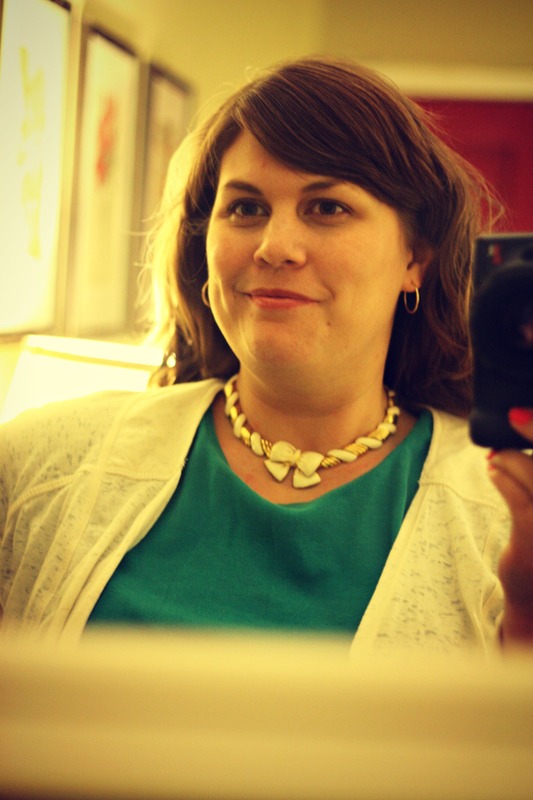 Here I am awkwardly modeling the bow necklace. Excuse the quality, I attempted a self portrait with poor lighting and shaky hands. Next time I’ll have to use a tripod and a remote. But you get the idea of what this little bow is supposed to look like. Goodness, I need to slow down on the old stuff shopping or get a bigger house, because honestly I’m running out of room for all of my pretties. Have you bought or “shopped” for anything on the side of the road that turned out really awesome? 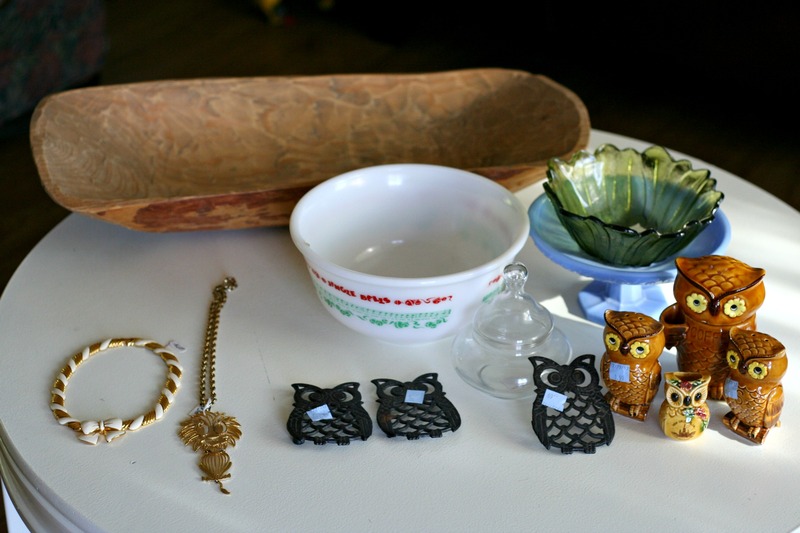 Cute stuff – I esp like the cake stand and the owl trivets! nice! Thanks! I can’t wait to use the cake stand! Once it gets below 190 degrees in my kitchen I might start baking again!